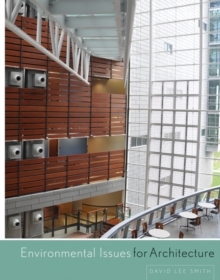 This primer for architects explores the basic physical principles and requirements of every aspect of passive and active controls in buildings. Avoiding needless jargon, Environmental Issues for Architecture supports an understanding of environmental systems in order to inform architectural design. With topics ranging from lighting, acoustics, thermal control, plumbing, fire protection and egress, to elevators and escalators, all of the latest technologies are supported. Designer-friendly, this rich resource gives just enough technical information for architects to design buildings that are efficient and comfortable.